A matt black finish suitable for wood/metal, also ideal for coating or re-coating traditional blackboards or pin boards. A high quality traditional solvent based paint. Manufactured in the UK by FLAG Paints. A very hard-wearing chemically resistant paint. Ideal where conditions require a degree of chemical and water resistance typical examples would be swimming pools, manhole covers and metal tanks. It is also excellent for road markings where high visibility and durability is a must. For concrete and ferrous metals. Suitable for road markings tank lining &amp; manhole covers. Theoretical spreading rate 15 sq. metres per litre. Manufactured in the UK by FLAG Paints Ltd.
Colourman Chalk Paints provide a milky/matt finish. They are ideal for achieving various effects and finishes from distressed furniture to crackle glazing, interior decoration and replicating a lime wash finish. Manufactured from natural earth pigments fortified with china clay and aqueous resins, these paints reproduce the traditional effects associated with the traditional chalk paints of the 18th and 19th century, recreating that lovely flat chalk like finish. Invaluable for the interior decorator, cabinet maker, restorer, architect and home owner for creating those soft natural finishes seen on old pine furniture and in old properties decorated with lime wash. FLAG worked with Chris Mowe of Pinebrush Colourman to develop these products over 30 years ago. Pinebrush Colourman are a well established family run business, specialising in producing and selling a range of paints, made to an 18th and 19th century recipe. These products are available in an extensive range of traditional colours. They are not available to buy direct from FLAG, but the buttons on the right hand side will take you to the Colourman website. Clear coating used to seal concrete floors, walls and block paving driveways. Theoretical spreading rate 16 sq. metres per litre. Manufactured in the UK by FLAG Paints Ltd.
A superior alkyd topcoat reinforced with polyurethane resin. For all general wood and metal surfaces. Undercoat with trade undercoat. For interior and exterior use. Manufactured in the UK by FLAG Paints Ltd. Coverage 15m² per litre. Quick drying paint to give a hammer finish to metal substrates. Easy to apply. 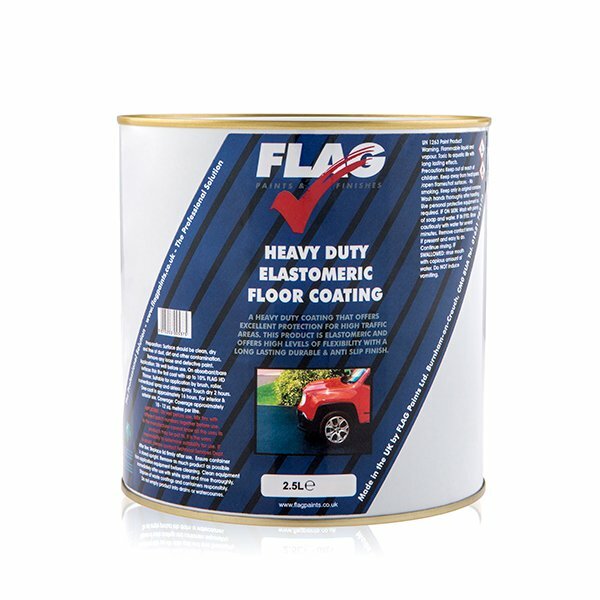 Compatible with FLAG Anti Corrosive QD Primer. Excellent corrosion resistant properties. Semi-gloss finish. Coverage: 5m² per 500ml. This product is normally a special order item (with minimum order quantities) but some excess stock may be available in QuickBuy. A blend of high quality thermo-acrylic and polyurethane resins resulting in a heavy duty coating that offers excellent protection for high traffic areas. This product is Elastomeric and therefore offers high levels of flexibility for a long lasting durable finish. Ideal for areas that are subjected to frequent heavy use eg. car parks, stairs, walkways, high traffic public areas, and industrial work areas. Contains Dolomite stone to provide anti-slip properties. This product has a very fine textured, almost smooth, finish. Suitable for external areas such as driveways, pavements and balconies. Click here to view the slip resistance test certificate. Manufactured in the UK by FLAG Paints Ltd.
A superior water based emulsion with an anti mould additive. Specifically suited to areas with high humidity and condensation which can lead to the growth of mould and bacteria. The finish is extra durable and washable. Coverage 12 sq m per litre. 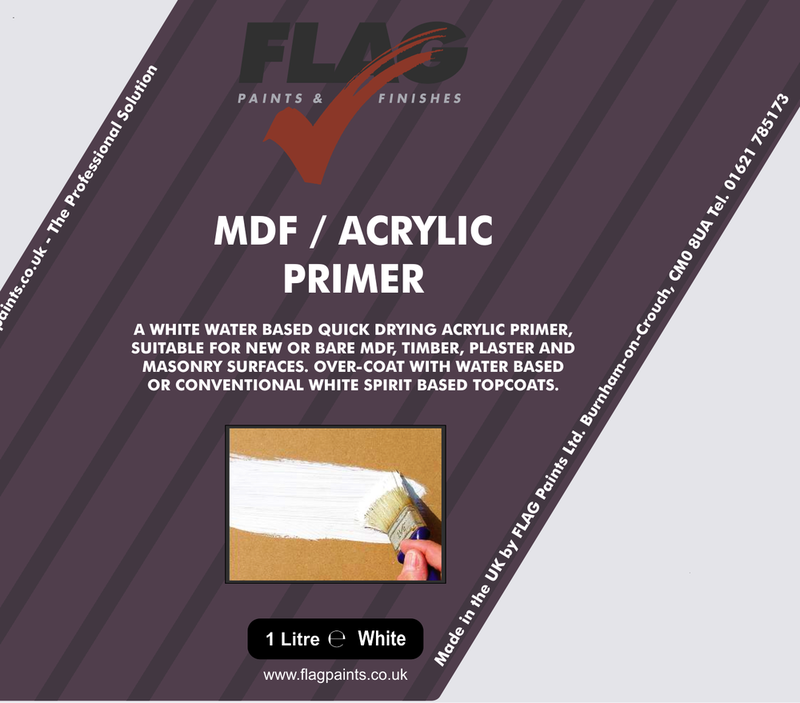 A water based quick drying acrylic primer suitable for new or bare MDF, timber, plaster and masonry surfaces. Over-coat with water based or conventional white spirit based topcoats. Recommended for applications where speed of application and/or low odour during the drying process is important. Coverage: 12m² per litre. A high quality one coat alkyd resin gloss system. Suitable for all wood surfaces and also metal. Suitable for use over a wide range of conventional single pack solvent based primer/undercoat paints. Made in the Uk by FLAG Paints Ltd. Coverage 15m² per litre. Traditional shellac based sealer for resinous knots on timber. Ideal for restoration purposes. Provides ongoing protection against the resin of knots. Formulated to seal knots and prevent resin seepage. Very popular for use on pine. Manufactured in the UK by FLAG Paints Ltd.
A high quality waterbased smooth masonry paint. Manufactured using a blend of premium quality resins for extra strength and flexibility. Provides excellent protection against adverse weather conditions. This product is part of the FLAG premium range. No primer required simply thin with up to 10% water if applying on bare or absorbent surfaces. A high quality obliterating water-based matt smooth masonry paint with extra strength and flexibility. (supplied as 3 x 5 litre). Coverage 8-12 sq m per litre. Manufactured in the UK by FLAG Paints Ltd.
A high quality waterbased fine textured masonry paint. Manufactured using a blend of premium quality resins for extra strength and flexibility. Provides excellent protection against adverse weather conditions. This product is part of the Flag premium range. No primer required simply thin with up to 10% water if applying on bare or absorbent surfaces. (supplied as 3 x 5 litre). Coverage 8-12 sq m per litre. Manufactured in the UK by FLAG Paints Ltd.
Polyurethane floor paint based on a high quality resin system with a tough smooth finish. It is suitable for application to most surfaces and will provide a hard wearing, water and oil resistant finish, this product is ideal for factory and garage floors. It is only necessary to seal a porous substrate such as new or bare concrete. A sealer coat is achieved by adding 10% white spirit to the paint. Please note new concrete floors can only be painted after 6-8 weeks. Manufactured in the UK by FLAG Paints Ltd.
A quick air drying enamel based on high quality polyurethane and alkyd for the high levels of durability and flexibility. FLAG Anti Corrosive QD Primer is recommended for use with this product. This is a tough industrial paint with rapid drying properties which permit short down times when rapid handling of components is required after painting. A high build oxide primer with quick drying properties. An anti-corrosive primer suitable for either brush or spray application. The primer gives excellent adhesion to ferrous metals. Can be over coated at any period of time after the recommended drying time. Suitable for use with a wide variety of top coats. Normally a special order only item. Specifically developed to provide instant waterproofing for leaking roofs, an all-weather product that can be applied even in damp conditions. Roofix 20/10 can be used to repair specific areas that are leaking or totally waterproof an entire roof. This product is multi-purpose and can be utilised on a wide variety of problem areas. A single pack elastomeric acrylic based (non bitumastic) compound, with built in Draylon fibre reinforcement, providing excellent flexibility and durability. Provides exceptional adhesion to virtually any roofing material. Roofix 20/10 does not require special primers, and can provide long term protection in excess of 10 years. Manufactured in the UK by FLAG Paints Ltd.